Turnberry Isle Miami is set on 300 verdant acres in South Florida, offering two amazing golf courses designed by Robert Trent Jones Sr., a great spa, a marina and a private beach club. Guest accommodations include 392 guest rooms and suites with balconies, whirlpool tubs and romantic French doors. Spend your vacation next to one of the three outdoor pools, get massages at the spa and play a round of scenic golf. Jogging is a great way to get a workout first thing in the morning, followed by a fishing trip from the resort's marine. Those traveling on a private yacht can rent one of the slips at the marina. Services offered include 24-hour security, 30-, 50- and 100-amp service, cable television, two phone lines, mail service, laundry service, valet, showers, ice, a private pool and a Crew's lounge. With its calm surroundings, luxury service and innovative spa treatments, the hotel is a relaxing spa getaway in Florida. The wellness center offers an extensive list of services, including body, bath, Kur, massage and facial treatments. The property features two 18-hole courses designed by Robert Trent Jones Sr. Given the resort's convenient location between Miami and Fort Lauderdale, the hotel is a quick getaway from the East Coast. The private golf club is open only to resort guests and members. The South Course has the famous Island Green at the 18th hole. The North Course winds around Lake Boros, offering many challenges. There is a Golf Learning Center catering to players of all skill levels. A selection of two, three and five-day programs is available. When booking your room at the resort, ask for golf packages and golf learning center packages. Kids' Connection for ages four to 12 offers activities such as cooperative games, arts & crafts, sports, drama, swimming and Legos. Half-day programs are $45 per child and run from 9 a.m. to noon and noon to 3 p.m. or parents can choose a full-day schedule – at $65 per child - that includes lunch from 9 a.m. to 3 p.m. Bed & Breakfast Package rates start at $180 USD per room, per night. 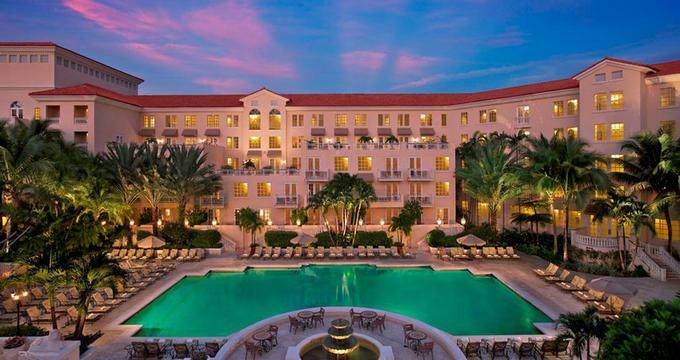 Because of its location between two major international airports and seaports, Miami and Fort Lauderdale, the resort is easily accessible from around the world.